For musicians, sound designers, and podcasters, the AudioBox iTwo is ideal for recording to Mac, PC, and Apple iPad! For mobile musicians, sound designers, and podcasters, the USB 2.0 AudioBox iTwo provides high-quality audio I/O for Mac, PC, and Apple iPad! 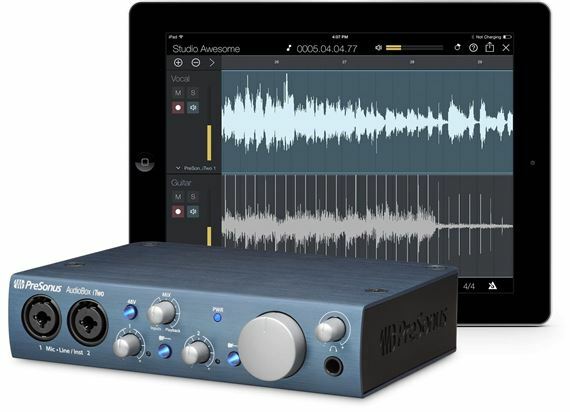 This compact, ruggedly built PreSonus interface offers high-performance Class A mic preamplifiers, record 24-bit audio at up to 96 kHz, and include powerful, easy-to-use Studio One Artist DAW for Mac and Windows and Capture Duo recording software for iPad. Like all PreSonus interfaces and digital mixers, the AudioBox iTwo comes with the award-winning, all-muscle, no-bloat Studio One Artist recording and production software for Mac and Windows. Studio One is incredibly easy to use thanks to its clear, straightforward, single-window design and powerful file browser with extensive use of drag-and-drop. As a result, you can record your inspirations quickly, without getting distracted by the tools. In addition, Studio One Artist includes a wealth of professional-quality plug-ins, virtual instruments, sounds, and loops. If you want even more, there’s a low-cost upgrade path to Studio One Producer and Professional. For more information, visit www.presonus.com/products/studio-one. Studio One Artist is excellent for Mac and Windows but you probably want to record on your iPad too. That’s why PreSonus created free Capture Duo two-track recording software for iPad. Based on PreSonus’ Capture live-recording software for StudioLive mixers, Capture Duo lets you record two stereo tracks using the AudioBox iTwo or any other iPad interface that supports Core Audio for iPad, including the iPad’s built-in mic. If two tracks isn’t enough, no worries! Just go to the App Store and purchase the low-cost, multitrack Capture for iPad. With Capture for iPad, you can record up to 32 tracks with 24-bit, 96 kHz fidelity. Capture on iPad and Transfer to Studio One—Wirelessly! With Capture Duo or Capture for iPad and an AudioBox i-series interface, you can record with your iPad, then wirelessly transfer your recordings directly from your iPad to a Mac or PC running Studio One. Then edit, sweeten, overdub, and mix with the power of a world-class DAW. With AudioBox iTwo, Capture Duo/Capture for iPad, and Studio One, hardware devices and software apps are integrated in one seamless system so you can record and produce your music anytime and anywhere. When you’ve finished mixing your masterpiece, it’s time to get it out to the world—easily done with your included Nimbit Free account! Nimbit is the leading direct-to-fan service; it enables you to sell music and merch to your fans from beautiful storefronts in Facebook, Jango Internet Radio, PledgeMusic, and on your own Web site. Nimbit is international, too, so you can choose a language for your storefront and accept currencies from around the world. Nimbit was designed to take care of the hard stuff, so you can stay focused on your music and your fans. It handles payment processing for your sales, and if you like, you can let Nimbit do warehousing and fulfillment for your physical goods. That’s not even close to all it can do. Turn to your Nimbit Dashboard, which shows you analytics such as your direct sales and how many new fans you have. The AudioBox iOne and iTwo deliver excellent audio performance, thanks to PreSonus’ newest, sweet-sounding Class A mic preamplifier and professional-quality, 24-bit converters that sample at up to 96 kHz. PreSonus uses high-quality 24-bit, 96 kHz analog-to-digital and digital-to-analog converters with 105 dB of dynamic range. The DACs feed a pair of balanced 1/4-inch, line-level outputs and an ultra-loud, crystal-clear headphone output. PreSonus designed AudioBox iTwo to excel as a mobile interface, so they built it to take a serious pounding and remain completely reliable. It’s built like a small tank, with a metal chassis and knobs/jacks secured directly to the enclosure to reduce strain on the internal circuit board. PreSonus includes an internal analog mixer with zero-latency monitoring, enabling you to monitor recorded tracks and overdubs with no annoying delay time. The iTwo lets you create your own mix. PreSonus also included a Kensington key lock to keep your AudioBox i-series interface safe when you travel. And the iTwo has MIDI In and Out so you can use your keyboards and controllers. Excellent sound quality. Easy to use. Well worth the money. Excellent interface. Works with garage band which is what I needed. The Audiobox iTwo is well built, very clean and very functional! The software is great and Presonus is AMAZING stuff! I highly recommend Studio Artist 3 and the Audiobox iTwo! Works nice. But it would work better with more options for input and out put. The color is nice and the metal chassis is really cool but the knobs feel cheap like plastic. I love the versatility of being able to record with iPad, Mac and even iPhone but I never liked that Presonus took so long to update it's software for the latest OS X update. I only got this b/c I was in a financial pinch and had to sell my Apogee Duet. So during those tough times I enjoyed it for what it was but I am definitely going back to Apogee.